When Russian President Dmitri A. Medvedev arrived in Jericho, Palestine, last week, he was received by an honor guard and by Palestinian Authority President Mahmoud Abbas. Medvedev came to Palestine to reaffirm his country’s support for a Palestinian state with its capital in East Jerusalem. The Soviet Union endorsed the creation of a Palestinian state in 1988. Medvedev’s reaffirmation of that endorsement adds Russia to a list of more than 120 nations which have called for the establishment of a Palestinian state. Recent Latin American countries joining the list are Chile, Ecuador, Bolivia, Brazil, Argentina, and Uruguay. Spain is expected to be next. Medvedev’s Palestinian hosts in Jericho were quick to point out that this was the first time such a high-profile international figure had gone to Palestine without also going to Israel. Medvedev did not go to Israel, ostensibly because of a strike by Israeli Foreign Ministry officials. That official excuse was issued by the office of Foreign Minister Avigdor Lieberman, but the FM is well known for his ability to insult leaders of other nations, the larger the better. Unfazed by Israel’s refusal to arrange a visit, Medvedev kept his appointments in both Palestine and Jordan, an action that could not have pleased Lieberman, who initially refused to grant a visa for the Russian president to enter Palestine. That bit of petulance did not prevail. A visa was finally produced. The diplomatic foot-dragging highlighted Israel’s control over Palestine’s borders, a further reminder that Palestine is still not an independent nation. Are you listening, you friends of Israel in the US Congress and in the churches of America? The President of Russia knows something you are unable to grasp. To live free is a God-given gift; not to be free is something quite evil. Israeli Foreign Minister Lieberman knows all about freedom, both having it and not having it. His family came to Israel as immigrants from the former Communist-controlled Soviet Union. The Liebermans originally lived in Kishinev, Soviet Union (now Moldova). FM Lieberman now resides in an illegal Israeli settlement on the West Bank. President Medvedev was traveling in Palestine and Jordan with a large media contingent, which of course, is important to foreign visits like this. Taking advantage of his proximity to the Jordan River while visiting a Muslim country, Medvedev traveled to a national and religious park which honors the traditional site of John’s baptism of Jesus. He had to have known that there is also a traditional baptism site on the Israeli-controlled western side of the river. That site is now surrounded by land mines and barbed wire. It is closed to the public. A shirt-sleeved Medvedev (above) dipped his hands into the Jordan River in a traditional Christian gesture. Medvedev is a member of the Russian Orthodox Church, which estimates it has a membership in excess of 80 million members living in Russia. There are around 25 million Muslims in Russia today, a dramatic increase of 40 per cent since 1989. Russian officials estimate that by 2020, with the continued growth rate, Muslims will account for one-fifth of the entire population. This, however, was a day to honor Medvedev’s own religious community. His pilgrimage to the banks of the Jordan River came on the Russian Orthodox Day of Epiphany, January 19. Western churches celebrate Epiphany on January 6, to recall the visit of the Wise Men to the Christ child. Both the Russian and the Serbian Orthodox Churches celebrate the January 19 Epiphany as the beginning of the earthly ministry of Jesus. During his visit to Palestine, specifically to Jericho, just across the border, Medvedev and Palestinian President Abbas participated in the formal opening of the Jericho Museum, built by Russia on land returned to Russia in June 2008. The museum was built on 105 dunams (25.6 acres) of land once owned by a Russian Tsar and abandoned during the socialist revolution. The property was returned to Russia via the Imperial Orthodox Palestine Society. Also on Epiphany Day, President Medvedev met with Jordan’s King Abdullah. According to the Jordan Times, the two men “discussed steps to enhance cooperation in the field of nuclear energy, through Russia’s investment in the Jordan’s nuclear program, as well as the transport, water and agriculture sectors”. The two leaders “signed a memorandum of understanding to boost cooperation in the fields of oil exploration and energy.” The Russian news agency RIA Novosti, reported that the memorandum “allowed for the exploration of the Jordanian vast oil fields by Russian firms”. They also agreed to support Palestinian independence, bringing additional diplomatic pressure on an early February meeting of the international Quartet of Middle East mediators (Russia, the US, the UN and the EU). The Quartet is working to revise peace talks between Israel and Palestine. What, exactly, did the American public know about this flurry of activity in Palestine and Jordan? Very little, even if you read a New York Times‘ story written from, and with the perspective of, the Israeli side of that looming, freedom-stifling wall that separates Palestine from the Western world. The Times‘ story had nothing to say about either religion or independence. It reported, instead that Medvedev’s visit “lifted the spirits” of the Palestinian people, sounding very much like a dutiful visit by a hospital chaplain I once heard about who kept a list of his daily rounds. At the top of the list was the category of “brief, but helpful visits”. In Gaza, a Palestinian was killed on Tuesday and two militants were wounded in a skirmish along the border with Israel, according to a Palestinian medical official. The Palestinian who was killed was identified as Amjad al-Za’aneen, 17. The Israeli military said that Palestinians detonated an explosive device near a force patrolling the border fence in the morning, and that soon after, the soldiers spotted two Palestinians handling a trigger system and opened fire. Did 17-year-old Amjad leave behind a grieving family? The New York Times does not say. Could he have been, though the Times still does not say, a teenager who dreamed of studying medicine? Farewell, Amjad. At least the president of Russia believes you should have been allowed to live free in your own country. 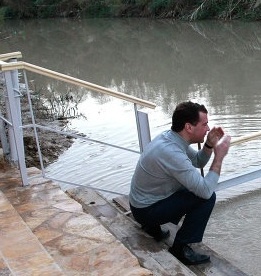 The picture of President Medvedev by the Jordan River, is from the Russian news agency, RIA Novosti. 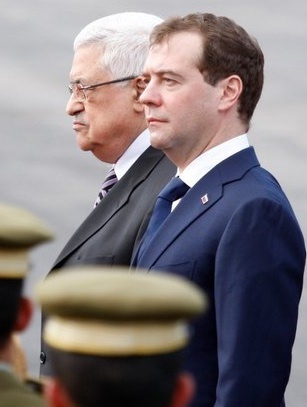 The picture of Medvedev and President Abbas is by Mohamad Torokman, of Reuters. This entry was posted in Media, Middle East Politics, Politics and Elections, Religion and politics. Bookmark the permalink. At last, at least one risk-taking journalist has “told it like it is.” Not the whole story, for Jim Wall was not on the scene to interview the 17 year old Amjad al-Za’aneen’s family, friends, or doctors. But he has been to Gaza frequently enough to know the situation and to Israel often enough to be aware of how nervous, immature and trigger-happy Israeli soldiers can be. Jim Wall has covered this desperate situation for years–through numerous U.S. presidential terms and Israeli premier-ships. He has heard, as I have, all the excuses for not resolving an issue that not only continues to fester but is growing like a cancer. Palestinians (and not a few peace-loving Israelis) are impatient for real leadership to end the longest occupation in modern history. Like Jim Wall, I am impatient too. I hope that members of the U.S. Congress and the President himself understands that many Americans are ready to hold them accountable for progress. The Times story was indeed an outrageous distortion and spin, ignoringthe key aspects and signficance of the Medvedev visit. Worse, tacking on the completely unrelated report, about the murder of the teenager, and further, implying that the reader should assume that the Israeli version of that event should be taken as the whole story of what happened. I cannot find the superlatives to express my appreciation for your words in your comments. The conversation about Israel and Palestine is changing–in the world and even in the United States. However, the Congress and the public face of the Obama administration continue to be held hostage by the hard-line, pro-Israel movement. We shall overcome and be vindicated some day! Your blogs will be credited with helping to move the ball down the field! By that time Palestinians will have been stripped of any semblance of freedom and human rights. It is possible that Obama will be able to reverse that in the next two years. I hope my bet on that happening wins the day. My appreciation and thanks to you for an eye-opening account of what we are missing in our news. Thanks ever so much for this story. And God bless you. Valerie from Palo Alto.